Mainland is our normal level survival world. To get to Mainland take the ship with the white sails from the Shipyard. 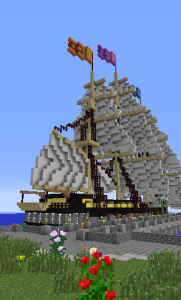 Grey Havens is the new survival world and will replace Mainland in the near future. Monsters are free to roam this world, and will kill you if they can. Fall damage is also on in this world, so watch where you step! You are expected to mine for materials. However, if you die and a staff member is available, they might be able to find your stuff (it has to be within 5 minutes of your dying, it can’t be a death to fire or lava, and they can’t be in the middle of working on something else). How do I get help from the staff?